Clint Eagar, the Co-founder of Eagar's Design, was raised and educated in South Africa. Finding his interest in art at a young age, Clint later attended ABM, the Johannesburg School of Art There he was able to nurture his interest and skills in Drawing, Sketches, Perspective drawing, Painting, Mixed Media and Sculpture. After immigrating to the States, Clint attended the Fashion and Arts Institute in Dallas, TX. Since then starting his career in the publishing business, Clint's work, Originals, Lithographs, and prints have been distributed internationally, in Europe, Scandinavia, Japan, Australia and North America. With a wide scope of talent and abilities, he stepped into a Director's position at an early age in the Gift Industry, designing, and developing consumer goods in the South Pacific Rim. Clint has run his own international trading company for many years and worked and consulted in many related industries. 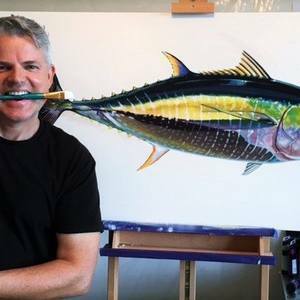 Clint has many interests, racing and diving are most favorite activities and he expressed his interests via his fine art paintings.